An in-depth EarthVPN review which is highly detailed, Find out how their service, speeds and more performs. Read our unbiased opinion of EarthVPN. The EarthVPN website at first glance is nothing special, while it is highly functional the aesthetics side leaves a lot to be desire. The design is rather tired but from a budget priced VPN provider it is to be expected that the latest web designs are not kept on top of. While other providers who charge a higher price may have more funds to invest in flash websites when you’re paying a no frills price then no frills is to be expected on areas such as website design. Aside from the slightly dated design of the website there are actually some rather neat features that the majority of other providers don’t give access to, at least not in a pre-customer environment. These include the ability to run speed tests across the range of servers they provide and the ability to ping all servers within the click of a button. It’s actually a very vital judgement test for any user considering signing up and goes some way to prove that EarthVPN are confident enough in their network to allow you to do basic speed tests and check bandwidth before signing up. If like myself the speed of servers is one of the greatest concerns to you before you part with your cash then such features give you some peace of mind and will no doubt aid your purchasing decision. The usual range of areas are present on the website including FAQ and access to Set Up guides. Their Set Up area is pretty in depth and comparable to many other providers with guides for a range of systems and access to downloading custom software for PC and Mac with Linux pending for the future. Strangely the EarthVPN website has access to their Twitter feed which should no doubt contain their latest announcements but seems to be frozen on the 2nd October 2013 even though their actual twitter account was active as recently as April 2014. Basics like this could do with improving to keep users informed but again possibly due to the budget price of the service such anomalies can be disregarded. EarthVPN follows suit with most providers and offers one standard package that alters only in length. Package lengths are available in 1 Month, 3 Month, 6 Month, 1 Year and 2 Year options. Selections other than 1 Month or 12 Months can be chosen further in the checkout process but not from the main order screen, slightly confusing but when prices are as low as US$3.99 per month and US$39.99 for the 12 Month package it is hardly time to grumble. That’s a little over US$3.33 per month if taking the annual package which is unbelievable value in comparison and what you can get for just shy of 40 US dollars at EarthVPN may get you 6 months or less at other providers. One area to be very considerate of is EarthVPN are very heavily add-on funded. While the basic package is extremely cheap it is light on features. For many users the basic package will be more than enough but it should be a consideration for those who require multiple device access plus better security that such features like connection for mobile devices costs an extra US$1.99 per month and 256bit Encryption adds another premium cost of US$1.99 per month. So while the standard price of US$3.99 appears cheap adding what some users would consider standard features boosts the price up to US$7.97 per month bringing them in line with most other providers. Due to the subscription lengths being rather limited it may be wise to test a 1 month package before committing to a longer length although with prices as low as these it would not be such a huge loss to take a gamble on an annual account. That said, with the difference being rather minor between the monthly and yearly packages on a month by month price it could be just as viable to take no risk and continue paying on a monthly basis. EarthVPN offer a 7 day money back guarantee and while I didn’t put this to the test myself they claim it is “no questions asked” and “unconditional”. Those who like to use slightly less common payment systems will be pleased to know EarthVPN have a range of payment options which includes all the usual suspects like Credit/Debit Cards and Paypal as well as some off the beaten track types such as WebMoney, AliPay, UKash, PaySafeCard and more. Bitcoin is also accepted which is always a huge bonus to those who want to have that added layer of anonymity when making payment. Pleasing to report is that the full range of VPN connection protocols are available on the EarthVPN service and when I say full range I mean PPTP, L2TP/IPSec, OpenVPN AND SSTP. While SSTP is lesser used than some of the others available it is certainly a nice addition and for those who look for such a connection type they will be very pleasantly surprised to find it available. Offering such a wide range of connection protocols will make the service more attractive to a wider audience and makes one wonder that when a budget provider can offer such a Swiss army knife solution in relation to VPN connection protocols then why can’t some of the others? EarthVPN offer custom software for both PC and Mac with Linux apparently in the pipeline to be released in the future. The basic package provided by EarthVPN provides 128 bit encryption with an available add-on package of 256 bit being available. While those who take 256 bit encryption aren’t likely to want to “downgrade” to 128 bit a rather strange situation is present in which if you did take the greater encryption add-on and wanted to occasionally use the lower encryption for whatever purpose you would be required to download two copies of the same software, one for 128 bit encryption and another for 256 bit. While this is unlikely to effect most users it would of been nice and more user friendly if the ability to select the encryption was available in just one version of software. Upon installation of the software on my Windows 8.1 system I was rather disappointed that the software didn’t take in to account the fact I have the 64 bit version of OpenVPN already installed on my system. I had to manually install OpenVPN 32 bit for the custom software to be able to function. While not overly a huge issue it is small polished areas like this which can effect your user experience and I would of liked that the custom VPN software automatically detect I already had a version of OpenVPN installed. Issues aside the software is highly functional albeit basic. All the basic features plus some additional advance options are available without masses of complicated settings screens. Usage revolves around one central screen. Your username and password are entered at this main window with the ability to save these details if required. One of the most pleasing aspects of the software is the ability to select the connection protocol used between PPTP, L2TP, OpenVPN and SSTP. Many providers offer custom software with it being a little hit and miss if they offer anything more than just OpenVPN, EarthVPN have gone the whole hog and offering the range of connection types really makes it an easy process for new and older users alike to connect via the connection protocol of their choice, a definite bonus of the software itself. A large range of ports are available on both UDP and TCP protocols which can obviously be used outside of the software also. Servers are organised by country and then location which makes finding your choice of location easy and tidy. Further options available include the ability to auto reconnect should the connection drop, a troubleshooting option which enables the a log output of the software and the connection protocol used plus an kill switch which should stop any internet activity should the VPN connection drop. While the software is simplistic in essence and there are one or two teething issues the actual working of the software is actually rather good and for those making use of a desktop will find it quick and easy to use. No software is available for mobile devices which is a shame and would be something that would be ideal in the future, those who use such devices will have to make do with the range of set up guides available on the EarthVPN website. Those who don’t wish to connect via custom software will find access to such things as OpenVPN configuration files within easy access on their website also. While the software has no DNS leak protection as such when connecting to the service users are automatically assigned to Google servers. While this is slightly better than using your own ISP DNS servers it would be more advantageous if EarthVPN would follow suit of many VPN providers and offer their own logless and encrypted DNS servers. While such an option is not available the ability to easily alter or select your own DNS servers via the software would be a handy addition. Port Forwarding is not available on the basic package provided instead being available as an additional charge as appears is the case for many of the more “advanced” features. The price while reasonable on its own at US$1.99 per month does seem rather high in comparison to the actual package price which is half the price of the basic package on top. In a way this add-on type system is perhaps rather good because it allows users to customise the service to their particular needs and not pay for features which they have little interest in using. To enable all add-on features is likely to bring the monthly cost in line with most other providers but for those only requiring the basic service savings are obviously rather attractive. Those interested in sending email via the service from a desktop client will find the standard SMTP protocol port blocked, however IMAP and other secure SMTP protocols are allowed so email is entirely possible to be sent and received via the service dependant on what type of email system you make use of. One of the biggest benefits of the EarthVPN service is they are in the higher end when concerning available locations. 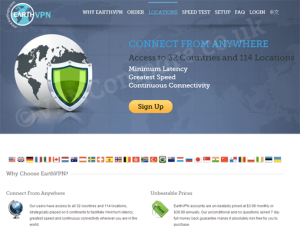 As of the date of this EarthVPN review they currently have 134 different locations available in 32 countries. While the majority of these are concentrated around Europe and North America there are at least 7 country locations in the Australia and Asian regions and 1 in each of South Africa, Brazil and Panama. Due to the expanse of servers available the EarthVPN service would definitely be ideal for those who travel or require a multitude of locations for their needs. P2P and Torrent access is allowed on select servers on the network. This is signified by the tag “P2P” in a list you receive in your welcome email. It is also highlighted in the custom software itself which servers are suitable which is a nice additional thought in itself. Germany, Netherlands, Romania, Sweden, Luxembourg, Panama, Hong Kong and Canada are the only servers authorised for P2P use. Standard IP access is of the Dynamically-Shared type meaning the IP will change each time you connect to the same server but there is the possibility of other users making use of exactly the same IP address at the same time further enhancing your privacy. It is possible to order a Static IP address if you have a need to which can be purchased like many of the more advanced features of the EarthVPN service for an extra fee per month. Accessing streaming services is a big use of VPN services and in recent months the popular US service Hulu has moved to block many VPN providers from accessing the service. Users have had hit and miss luck with many VPN providers and there are those who are specifically looking for a reliable VPN provider solely to access Hulu. EarthVPN have at least 46 US based server locations and by selecting 11 randomly 9 out of the 11 VPN servers worked perfectly with Hulu with only 2 being restricted. Based on these results I am confident that EarthVPN as of the date of this review publication will be ideal for using Hulu. Although overall the service was actually rather good for connecting to I did on a rare occasion receive an error that my username and password was wrong even though it hadn’t changed and one or two servers were unable to be connected to on random occasions. Not quite sure what those issues were but as stated they weren’t regular occurrences but could be somewhat annoying if you had desperate need to connect to a certain location. One of the first things to consider to the benefit of EarthVPN is their physical location. As users look for more secure providers many consider using what are known as “off-shore” providers, basically providers who don’t reside in one of what is considered the main countries or territories, certain users with to avoid providers located in the United States or European Union as they feel for privacy reasons these are less likely to be under the influence of or monitored by one of the three letter agencies. EarthVPN are located in Northern Cyprus which for those unaware is a little bit of a wild west “country” in the fact it isn’t actually recognised as a legitimate place by any other nation than Turkey. Without going in to too much detail Northern Cyprus or the Turkish part of Cyprus is considered illegally occupied and should actually be part of the wider Cyprus which is made up mainly of Greek Cypriots. Anyway, regardless of the rights or wrongs of the political aspect it makes Northern Cyprus a little bit of a misnomer meaning that pressure from outside countries or agencies is unlikely to hold much ground with EarthVPN based on the location they operate from. However regardless of jurisdiction of any provider it is important to note that users who carry out illegal activity can still fall foul. In 2013 it was reported that a user making use of EarthVPN’s Dutch server was arrested for making bomb threats. It is claimed that police were able to obtain logs via the data centre in which EarthVPN hosted their server. EarthVPN have since claimed they cancelled their contract with the data centre in question although it lead many in the industry to question how this situation arose considering the claim of “no logs” by EarthVPN. No matter the truth behind the situation we would never encourage any user to carry out illegal activity nor recommend a VPN for such purposes and when serious issues as bomb threats are made via the cloak of any VPN service it is likely security services would use all and any such avenues to catch the perpetrator. Had such bomb threat been carried out I’m sure the majority of people would of been accepting of the fact such a user was able to have been caught regardless of the method used. However the rights and wrongs of such incidents are outside the scope of this EarthVPN review. As per usual I followed our standard reviewing process which included testing the service generally for around 10 days. This included making use of general internet activity such as web browsing, VOIP usage such as Skype plus other general internet related tasks like viewing streaming content from services such as BBC iPlayer, Hulu and Sky Go. Mainly I used a handful of their European servers including the UK, France, Germany and Italy and found web browsing to be in the main without issue. Upon initially testing I did experience some slight issues with their Manchester, UK server which appeared to hang regularly when doing simple web browsing. This problem was also noticed on the same server when attempting to stream BBC iPlayer in HD in which the stream stopped to buffer at regular intervals and in the end stopped completely mid way through a TV show. I rotated through their remaining UK servers and found no such similar issue. Due to the issue experienced on the Manchester, UK server I revisited the same site a week later using the same server and streamed content via BBC iPlayer without issue this time. Although rather annoying at the time it appears this incident may of been a one off although consideration of this should be taken. Accessing services such as Hulu in highest quality as well as TV services as far away as Australia via their Australian server was without issue and rather surprising for provider who offer such a cheap basic package. As a slight side note EarthVPN provide one of the fastest Indian servers I have ever seen to date and at one point I received up to 30 Mb/s with an average of around 11 Mb/s which compared to other providers is rather fast for a VPN location as obscure as India. Top marks for EarthVPN in that instance. As part of all our reviews we take a selection of servers at random and test them for real speed download. This is achieved by downloading a 1GB test file from a British testing website via a download manager. The download manager allows us to split the file across concurrent connections giving the best possible download condition. These results are from a UK based connection and as such the speeds achievable by yourself may differ based on your location. All tests were carried out using OpenVPN via UDP on port 1194 with 256 bit encryption. Our test internet connection is 152 Mb/s and as such would be the maximum available speed. On the standard price package lower encryption for OpenVPN is in operation which although not of great concern for those accessing geo-restricted content those more concerned about their privacy may wish to have strong encryption. The basic package offers AES 128 bit encryption with 256 bit available at an extra US$1.99 per month. The control channel makes use of TLSv1/SSLv3 DHE-RSA-AES256-SHA with a 2048 bit RSA key. The data channel on the higher tier encryption package is AES-256-CBC. PPTP operates using MPPE 128bit cipher with or without compression. L2TP uses the standard IPSec protocol either 3DES or AES encryption algorithm. SSTP protocol uses 2048 bit SSL/TLS certificates for authentication and 256 bit SSL key for encryption. Unfortunately one area which EarthVPN are lacking are in a clear policy section. Most VPN providers these days have dedicated areas to their various privacy policies and how they handle your data and their commitments to you as a user. While EarthVPN does have a small area (which is barely noticeable in tiny font) their policies are generally generic and could be based on any website or service and the policy type information is further fractured across a very thin few word answers section under their FAQ area. While they claim they log no user activity or usage and claim that it is impossible for a third party to match an IP address to an account it is disappointing that no clear and full policy information is available to answer the various questions that users usually have. Such thin information available needs to be most rapidly updated and a full policy area in detail on the website needed to alleviate any new user fears. In regard to DMCA notices these again are covered under the FAQ section and inform users that they should use the dedicated P2P servers where DMCA notices do not apply and I gather they will not be forwarded on to yourself should one be received. P2P and Torrent access is supposedly blocked on servers not authorised for such use and so users should in theory be protected from falling fowl of any DMCA type incidents that may occur should you access torrents and such like on a non-P2P server by accident. Like many providers EarthVPN provide support by way of Support Ticket/Email only. This is rather standard across the VPN industry although it would be nice to see one or two other contact methods available. As the standard package price makes them a more budget VPN provider it is only natural to expect less advanced contact methods to be available and in a sense, you get what you pay for. To the credit of EarthVPN even though the amount of contact methods may be lacking their actual response times are actually rather fast and in the majority of cases queries are answered extremely quickly regardless of time or day. I contacted them on three separate occasions with a range of queries, none overly technical, some which could be answered directly by looking at the FAQ and others which couldn’t. On the first occasion I contacted them on a Tuesday at 20:32 and received a reply at 20:36 a blisteringly fast 4 minutes later! The second occasion on a Monday at 18:48 and received a response at 10:40am the following morning which was rather slower than I expected. Lastly I contacted them again on a Tuesday at 13:41 and received a response at 13:58. So while in general they respond rather quickly it appears there are times when it is a little hit and miss and you could be waiting until the next morning to receive an answer. From this and past experience contacting them they are usually rather quick although on the second occasion in this test they probably could of done better. EarthVPN from the outset look like an extremely cheap and budget VPN provider. This is in fact true if you require a basic account without the bells and whistles that other providers offer. For those looking for a little extra from their VPN provider then the additional charges can quickly add up and with most add-on services costing around US$1.99 each it isn’t long before you’re up to a similar price that the majority of providers charge. However although this is the case it makes the service quite interesting and allows you to somewhat customise your package based on your own use. For those looking for a cheap and frill free VPN provider then their basic prices are extremely competitive and pretty much unbeaten throughout the industry. Due to this basic package price I was expecting a somewhat inferior product but was pleasantly surprised of the features available even on the basic package and impressed that once adding features via add-on prices their offering is as competitive as others around. The general requested features such as a large range of servers, fast speeds, port forwarding, P2P/Torrent use, Hulu working plus more are all available from EarthVPN, while many have to be paid for as additional features they are no more expensive even when taking the full set of features than many other providers. A large selection of server locations is available which makes the service suitable for those who travel a lot also. Server speeds and generally good, while not in the top tier of providers they provided in the majority at least a third of my overall internet speed of around 50Mb/s and coming from a connection of 152Mb/s that is rather good considering the majority of users around the world can not exceed those speeds generally. For those with ultra fast connections similar or exceeding and wanting to maximise those speeds then that was not generally possible with EarthVPN however I did manage to record over 100Mb/s on their Romanian server which was pleasing to see and could easily be used by the majority of European customers aiming to hit such speeds. While other providers have given good access speeds even on locations as far flung as Hong Kong unfortunately this was not the case here in off-peak hours, although in a non-test situation I would personally have no need for such a server the chance to use it was removed due to the abysmal speeds at that time on that specific server for myself, users closer to the location should fair better and as was the case later in peak hours. Encryption is when paid for as an add-on at an acceptable level and similar to many providers. The basic package is rather lacking on the encryption side and while still suitable for most users those who are privacy orientated will want to opt for the 256 bit encryption which adds an extra US$1.99 per month on to the basic US$3.99 price. Overall EarthVPN are a good provider of VPN services, the basic package while lacking in overall features makes a cheap option for those on a strict budget. Users with privacy concerns and extra needs will no doubt end up needing to pay for additional services and if EarthVPN is as good as or better than others available on the market when the price is ramped up through add-ons is debatable. A good range of server locations and decent speeds makes them a viable option for the majority of tasks and even though their budget price may seem rather low their service is indeed rather good and value for money which means you can’t really go wrong. A good offering and certainly one to consider!